Foragers coming and going from our top bar hive Venus, with other bees bearding by the front entrances. You can see our Langstroth hive Jupiter in the background. I have been in and out of the hives this month, and am a bit overdue with this update. With all the rain we’ve had the flowers continue to bloom and I can only hope the forage remains plenty. As soon as the heat settles in, probably right after our frequent rainfall ends, the nectar will likely dry up as well. I am told that in Virginia July 4th is the typical time to collect the year’s honey. Our hives are definitely still in the building phase, so no honey for us this year. I am a little disappointed, though they will definitely owe me next year…. The good news is that I really am more confident around the bees, as long as I have my bee jacket on. While I am still quite the novice, I do think of myself as a beekeeper. Pretty cool. Two shims for each side at the back of both hives leveled them out. 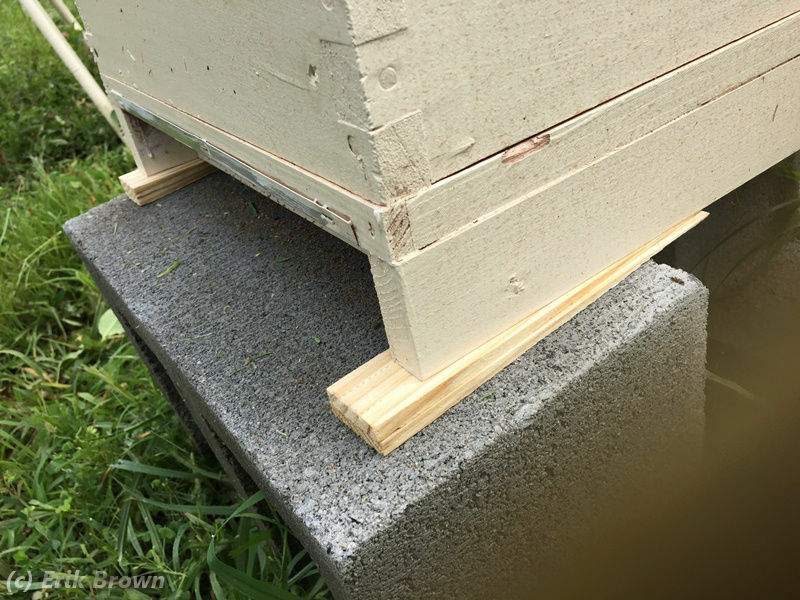 I finally leveled our Langstroth hives on July 11. I thought it would be hard; taking apart each hive, leveling the ground underneath, putting the hive back together. Turns out a few shims did the trick. Who knew? I have a theory that my prior feeder problems (of bees drowning) were caused by the fact that our hives were not level. With the hope of honey evaporating (ha!) and the heat of summer on its way, the bees are in need of more stores. Hence the need for feed has arrived. Helper S inspecting a frame from Mars. Last we wrote the queen in this hive was in question. I was pretty sure on June 21 there was no queen, and transferred a frame of larva from our other Langstroth hive. I’m happy to report that on July 5 (just 14 days later) I found capped brood. A new queen takes a couple weeks to emerge, plus time to mate and start laying, plus at least another week for brood to be capped. So I suspect the hive had a queen to begin with. Watching this hive last week, I thought some of the bees were lighter in color and was worried that the hive might be robbed by these new bees. 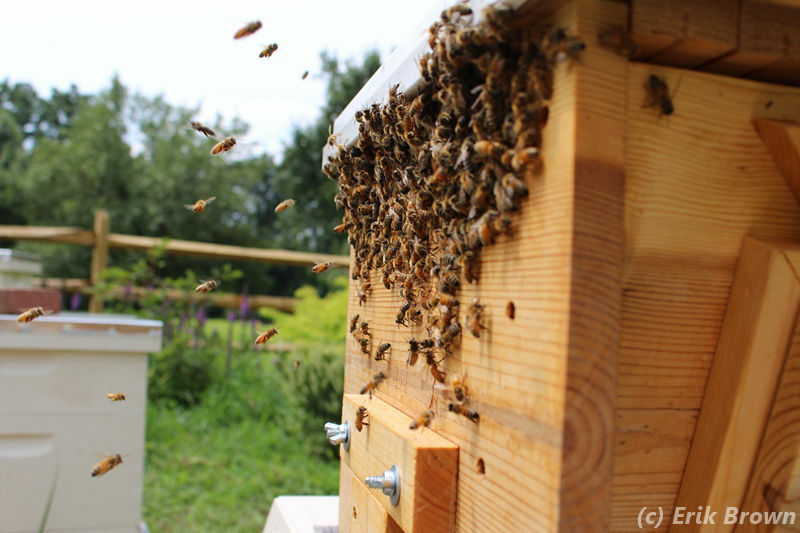 If you recall I saw some queen cells in the hive on June 7 (see Good Fences Make Good Bees). So I surmise that one of these queens might have hatched and was perhaps newly mated but not quite laying by July 21. This produced capped brood by July 5, and our full inspection on July 12 found six frames of brood. So the girls seem okay, albeit with only a few frames of honey. To address the stores issue, I put a half-gallon of sugar syrup in a hive top feeder yesterday morning. By this evening it was totally gone. I brewed another batch of syrup tonight to continue the feeding tomorrow morning. Our smallest hive is finally ramping up. On July 12 we found more brood here than in Mars, and the bottom box bursting with bees. This hive has only a single medium on it without much comb, so they are getting a full treatment of sugar syrup as well. The star of the bee yard continues to be Venus, our top bar hive. On July 12 there were 11 frames of brood, the same as my prior inspection, with the bees calmly going about their business across 18 frames of comb. Given their lack of stores, I started feeding this hive last week. I quickly discovered that they consume a quart of syrup in a day. On our inspection I found that they are storing this in the cells, which I presume is good. 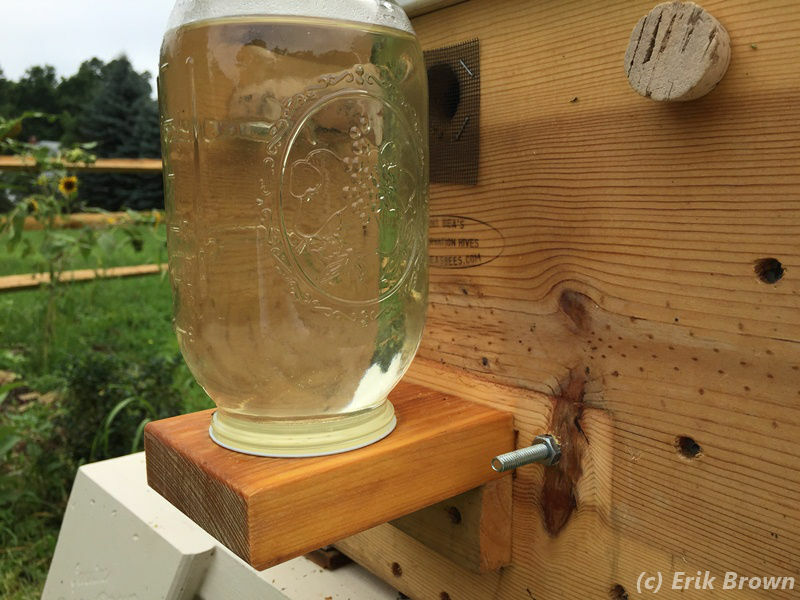 I only have the quart-sized boardman feeder for this hive, as shown in the picture, so I’m changing the bottle every morning. So far they’ve sucked down about 6 quarts of syrup with no signs of stopping. The foragers in all the hives are still out and about during the day, as shown in the picture for this post. I see them bringing in pollen and assume they are finding nectar as well. I’m told we often get a fall nectar flow around here, so hopefully the bees can build enough stores in the next few months to be ready for winter. In other news, I was finally able to coordinate schedules with my bee mentor, Kristen. We have talked on the phone, and found time for an in person discussion this weekend. 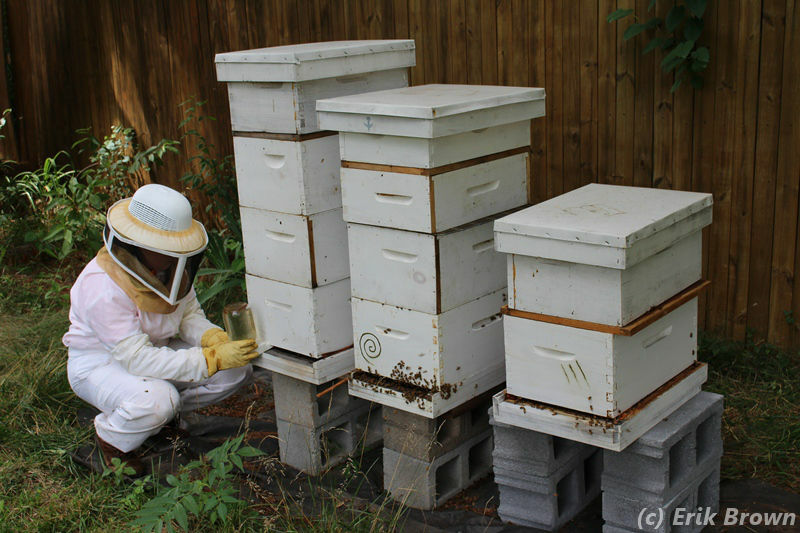 I went to her house and helped split her big hive, which consisted of three deeps and one medium box. She had already removed a medium super full of honey as well. We reduced this to two deeps and one medium, and created a new hive consisting of a single deep. Was fun to see someone else’s bees and help Kristen turn her two hives into three. 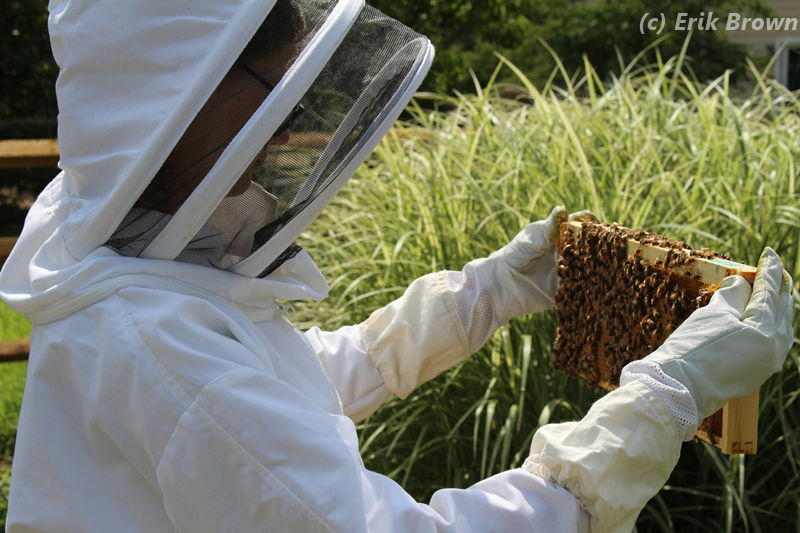 The picture shows Kristen setting a boardman feeder into a hive. The spiral hive is the one we split, with the new hive on the right. Note that there is an extra box on top of each hive as well. To be on the level is to be truthful and honest. This appears to come from the stone masons of the 14th century (see this English For Students site, for example), who are widely thought to be the founders of the Masonic Fraternity, or Freemasons. A number of moral lessons in Freemasonry are based on stone-cutting tools: on the level for honesty, square dealing for fairness, and so forth. The obvious tie-in to our newly-leveled hives seemed appropriate. A beautiful photo of your hives at the start of this post. I like the idea of 4 July traditionally being the time to harvest honey. If only bees kept to the diary! You may not harvest this year, but have you at least had a sneaky taste of the honey from the frame and what does it taste like from hive to hive? Yes but only a little. Perhaps I’ll sneak some still.